On June 9, 2007, Potts’ audition of Simon Cowell’s new search-for-a-star show Britain’s Got Talent was televised on ITV1 in the UK. The audition itself was held at the Wales Millennium Centre in Cardiff on March 17, 2007. Paul sang Giacomo Puccini’s “Nessun Dorma,” for which he received a standing ovation from the audience of 2,000 people. Contrary to popular belief, Paul did not sing a condensed version of the aria, but the full rendition. The editing process did not produce a “perfect” edit, as you can see his lips getting ready to sing the next line after his second “…Nessun Dorma…”, which starts with “Tu pure, o, Principessa…”. Potts’ rendition of this has been viewed on video upload site YouTube over 20 million times and is the highest rated video as of January 10, 2008 . In the semi-final on June 14, 2007, Potts performed main verses of “Con te partirò” (“Time to Say Goodbye”). He progressed to the final after receiving the highest public vote in that show. He performed a full-length “Nessun Dorma” for his finale on June 17, 2007 as well as an encore after he won the competition. Potts defeated co-favourite with the bookmakers, Connie Talbot and received the highest public vote out of two million votes cast to win Britain’s Got Talent, winning the right to perform at the Royal Variety Performance on December 3, 2007, in front of Her Majesty The Queen. Pavarotti annually hosted the “Pavarotti and Friends” charity concerts in his home town of Modena in Italy, joining with singers from all parts of the music industry, including Eric Clapton, Elton John, Sting, Bono and Sheryl Crow, to raise money for several UN causes. Concerts were held for War Child, and victims of war and civil unrest in Bosnia, Guatemala, Kosovo, and Iraq. After the war in Bosnia, he financed and established the Pavarotti Music Center in the southern city of Mostar to offer Bosnia’s artists the opportunity to develop their skills. For these contributions, the city of Sarajevo named him an honorary citizen in 2006. He performed at benefit concerts to raise money for victims of tragedies such as an earthquake in December 1988 that killed 25,000 people in northern Armenia. He was a close friend of Diana, Princess of Wales. They raised money for the elimination of land mines worldwide. He was invited to sing at her funeral service, but declined, as he felt he could not sing well “with his grief in his throat”. Nonetheless, he attended the service. In 1998, he was appointed the United Nation’s Messenger of Peace, using his fame to raise awareness of UN issues, including the Millennium Development Goals, HIV/AIDS, child rights, urban slums and poverty. In 1999, Pavarotti performed a charity benefit concert in Beirut, to mark Lebanon’s reemergence on the world stage after a brutal 15 year civil war. The largest concert held in Beirut since the end of the war, it was attended by 20,000 people who traveled from countries as distant as Saudi Arabia and Bulgaria. It was the tenor’s only concert in the Middle East. In 1978 Pavarotti was initiated as an honorary member of the University of Miami’s Beta Tau Chapter of Phi Mu Alpha Sinfonia, a fraternity dedicated to the advancement of music in America. Other honors he received include the “Freedom of London Award” and The Red Cross “Award for Services to Humanity”, for his work in raising money for that organization, and the 1998 “MusiCares Person Of The Year”, given to humanitarian heroes by the National Academy of Recording Arts and Sciences. Luciano Pavarotti, Cavaliere di Gran Croce OMRI (October 12, 1935 – September 6, 2007) was an Italian tenor in opera music, who crossed into popular music and became one of the most beloved vocal performers. He was one of The Three Tenors and was well known for his televised concerts and media appearances. Pavarotti was also noted for his charity work benefiting refugees, the Red Cross and other causes. He was born in Modena to the family of a baker. After abandoning the dream to become a professional football goalkeeper, Pavarotti spent seven years in vocal training and began his career as a tenor in 1961 in Italy. He then sang in houses in The Netherlands, Vienna, London, Ankara, Budapest and Barcelona. The young tenor earned both valuable experience and significant recognition while touring on the invitation of soprano Joan Sutherland and during his 1965 US debut in Miami on her recommendation. His position was solidified in the years between 1966 and 1972, during which Pavarotti first appeared at Milan’s La Scala, other major European houses and, in 1968, NYC’s Metropolitan Opera to great acclaim. By the mid-1970s, the tenor became known worldwide, famed for the brilliance and beauty of his tone, especially into the upper register. His “high C” became one of his trademarks. The late 1970s and 1980s saw Pavarotti making significant appearances in the world’s opera houses and establishing himself as one of the great singers of the era. The later years brought a decline in ability to perform on stage due to a weight gain and lack of mobility. 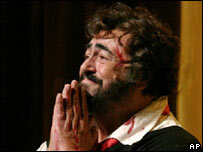 Pavarotti’s final appearance in an opera was at the Met in March 2004. The 2006 Winter Olympics in Turin, Italy saw him performing for the last time. Pavarotti sang Nessun dorma, with the crowd as its Chorus, and got a thunderous standing ovation. On September 6, 2007, he died at home in Modena from pancreatic cancer. World renowned tenor Luciano Pavarotti has died at his home in the northern Italian city of Modena. The singer, who was diagnosed with pancreatic cancer last year, was 71. His charismatic performances – particularly alongside fellow tenors Placido Domingo and Jose Carreras – helped bring a new audience to opera. 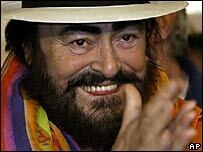 Pavarotti had cancer surgery in July 2006 in New York, five months after his last performance. He had not made any public appearances since then. He underwent five bouts of chemotherapy in the past year, and was admitted to hospital with a fever on 8 August. He was released two weeks later following diagnostic tests. Fellow tenor Domingo said he had “always admired the God-given glory” of Pavarotti’s voice, while Carreras called him “one of the most important tenors of all time”. The Vienna State Opera raised a black flag in mourning, while Modena said it would name its theatre after its famous son. Manager Terri Robson said in a statement that the tenor died at 0500 local time (0400 BST) on Thursday. “The Maestro fought a long, tough battle against the pancreatic cancer which eventually took his life,” she said. The funeral will be held at Modena Cathedral on Saturday. One of the tenor’s doctors, Antonio Frassoldati, told Sky TG24 the singer had been “always totally conscious of the situation, he always sought to fight the disease… and he was very calm”. Pavarotti enjoyed 40 years on the world stage and became one of the world’s biggest-selling artists. His music reached far beyond the usual opera audience, particularly his signature tune Nessun Dorma, from Puccini’s Turandot, which became associated with the 1990 football World Cup. His performances with Domingo and Jose Carerras at this time – in the Three Tenors concerts – were seen around the world. “We’ve reached 1.5 billion people with opera,” Pavarotti told critics of the shows. In a statement from Los Angeles, Domingo said he had fond memories of the Three Tenors shows. “We had trouble remembering we were giving a concert before a paying audience, because we had so much fun between ourselves,” he said. Nessun Dorma was part of Pavarotti’s final performance, at the opening of the Winter Olympics in Turin in February 2006. Pavarotti was married to his first wife Adua, with whom he had three daughters, for 35 years until they split in 1996. He then got together with his secretary Nicoletta Mantovani, who was 26 years old at the time. In 2003, they had been due to have twins, but only one survived, a daughter called Alice. The couple married in a lavish, star-studded ceremony later that year.